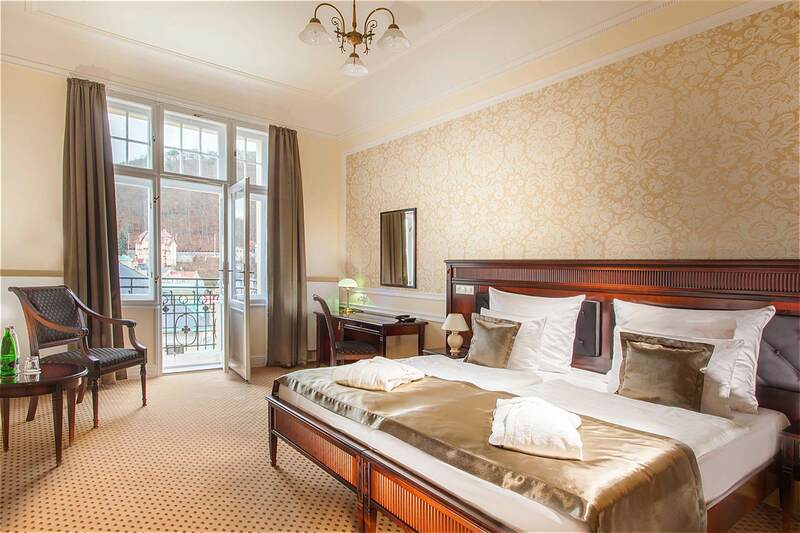 Suite rooms of Hotel Olympic Palace are furnished with cherry veneer, ornamental wallpaper and rich fabrics, which in their combination creates a very pleasant environment for relaxing time in the spa town of Karlovy Vary. The presidental room Olympic Suite is m2 and is furnished in original style of French Art Nouveau. 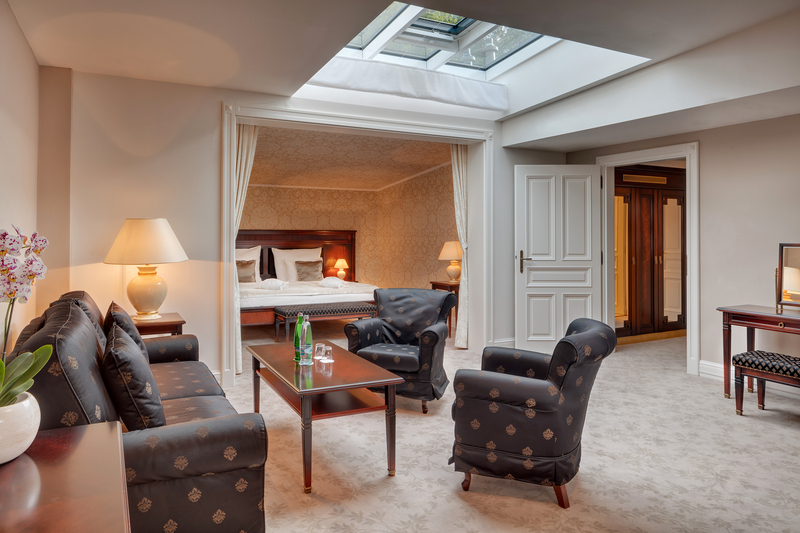 The other very specific room is Junior Suite Skyfall with a beautiful loft space, a separate corner for sleeping and a big velux window. 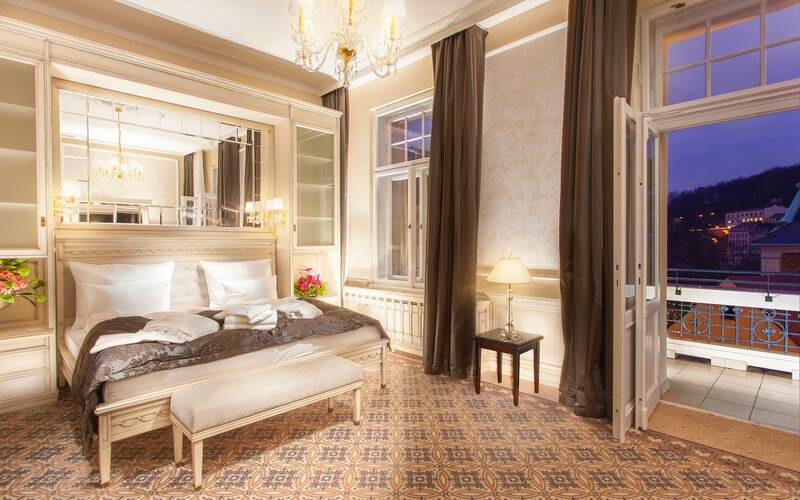 Thanks to complete reconstruction and tailor-made interior to suit customers, the hotel rooms have gain modern look, keeping the Art Nouveau architecture style in which was hotel built in the early 20th century. 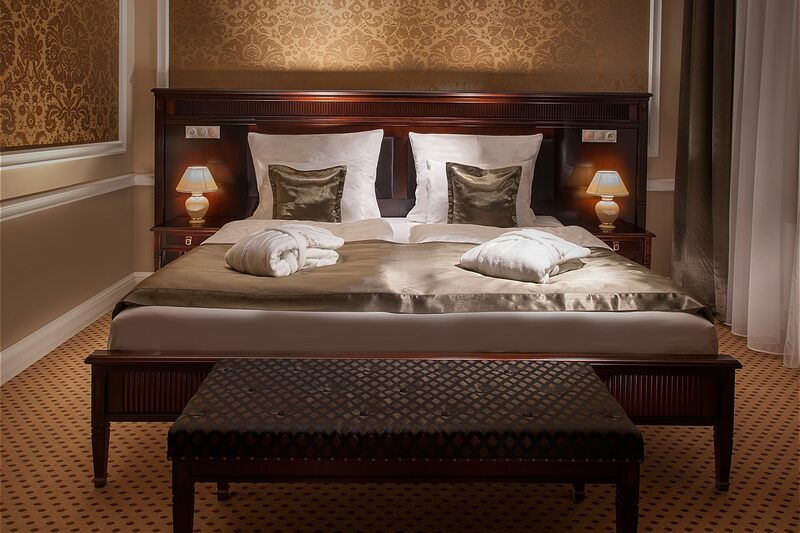 Luxury facilities in every room. Security safe with electric socket. Safe at the reception for large valuables. 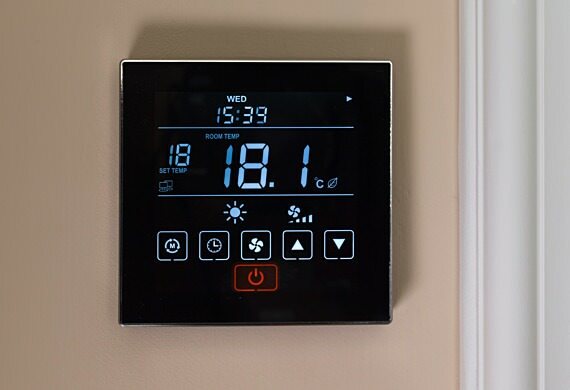 Air conditioning with automatic temperature control and the possibility of manual setting of +/-3 °C. Coffee and tea are refilled daily during the service. Television with remote control, 60 tv channels in many languages, and radio stations. Quick access to all the hotel staff in every department or dial-up connection to your home. High-speed internet access via Wi-fi totally free and without restriction. Cold non-alcoholic and alcoholic beverages, , healthy drinks and Carlsbad specialities. The possibility to order drinks apart a choice from the minibar, in-room breakfast or a meal from a special menu. Necessary trifles such as sewing set, brush and comb, shoehorn, clothes brush and choice from several kinds of hangers in the wardrobe. Available free of charge, a bathrobe and slippers in soft Terry cloth for the entire stay, special collections for children. 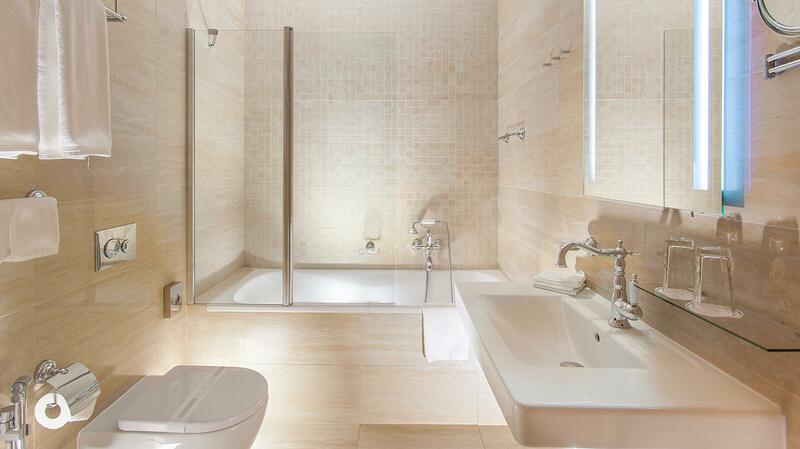 Every bathroom has heated floor for your yet more comfortable stay. In addition to several cosmetic sets to choose from, there is also a hair dryer, nail file nail polish, swimming caps and hygienic sets. Card for easy and safe access to your room, lifts and wellness center. Television with remote control, 60 tv channels in many languages and radio stations. 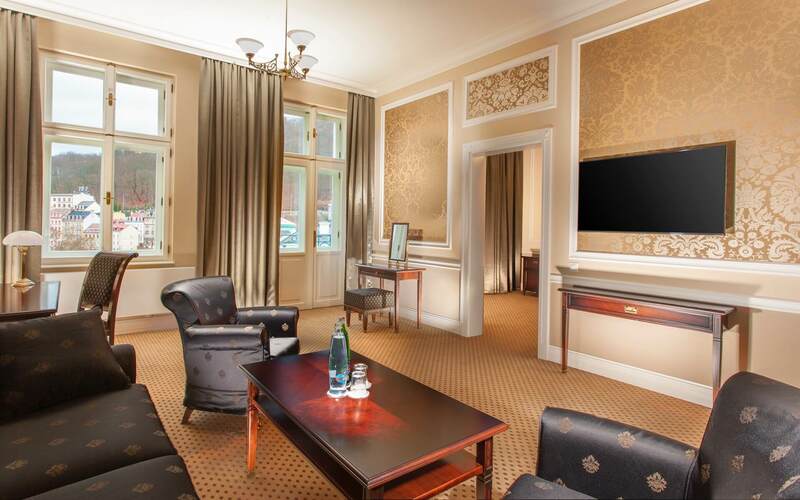 The Suite rooms have two separete rooms – bedroom and living room. Most of the apartments have balcony or terrace. In some we can fit an extra bed or can be connected to another room to give comfortable accommodation for whole family, children included. 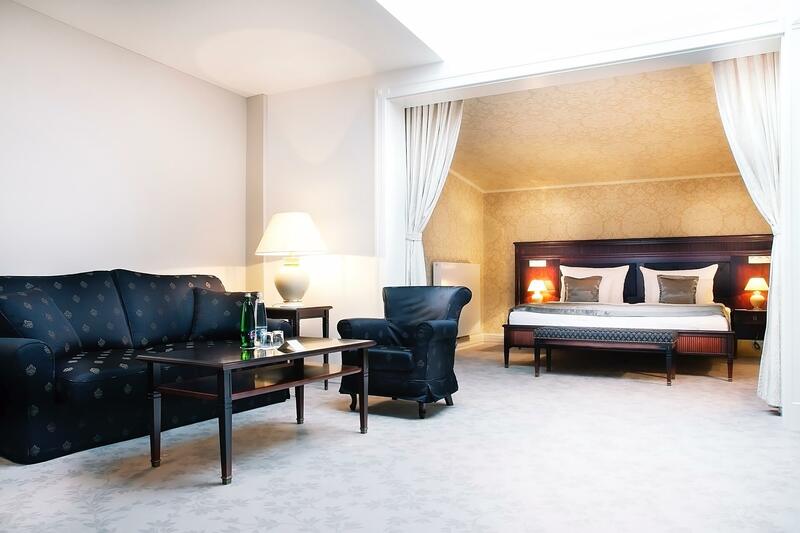 Up to 15 out of 58 rooms from Olympic Palace belong to Suite and Business Suite rooms. These rooms have bedroom and living room with a sofa, armchair, and an extra LCD television, some of them have an extra chest of drawers and some have coffee tables. You can choose between a view of the vibrant city or silent forest, walk-through or separate room, bath tub or shower. 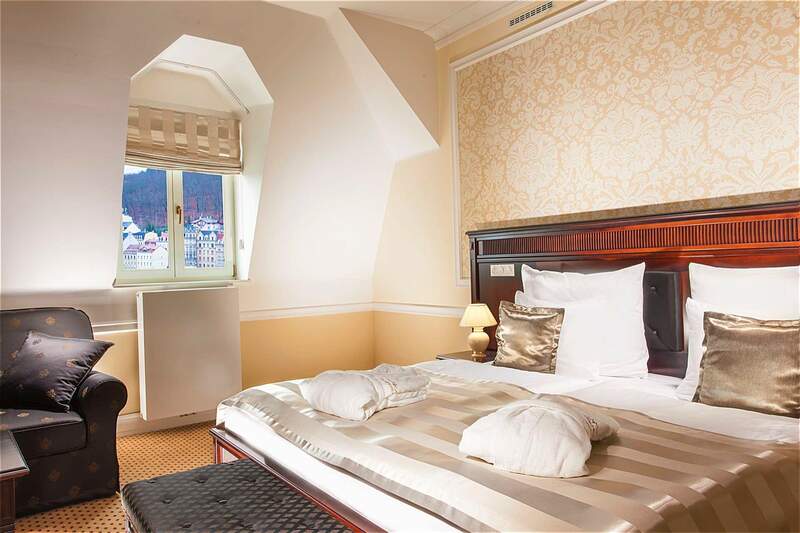 The most beautiful room from the whole hotel, is the Olympic suite on the second floor with a big balcony and a town view. If you would like to feel luxurious and stylish you are at the right place. Above standard dimensions of all the rooms, their equipment and style will indulge your splendor. 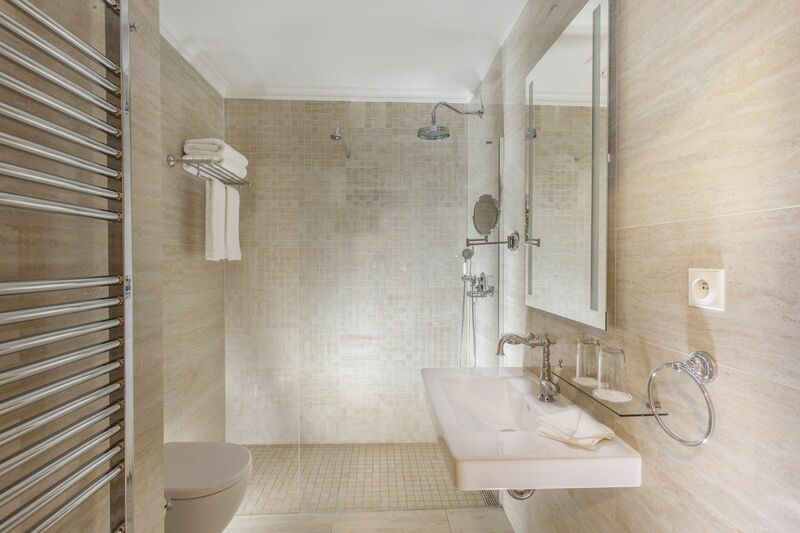 Large bathroom with a bidet, a spacious shower with massage and double-sink, oversized branded mattresses in the bed, 60 inch LCD TV, design crystal chandeliers and other amenities. Combined in a perfect harmony to pop-art style and classic elegant Art Nouveau of the 19th century. None of this will not leave you in no doubt that you have the best, what we provide in the Luxury Spa Hotel Olympic Palace. The apartment Junior Skyfall is only one in the whole hotel. 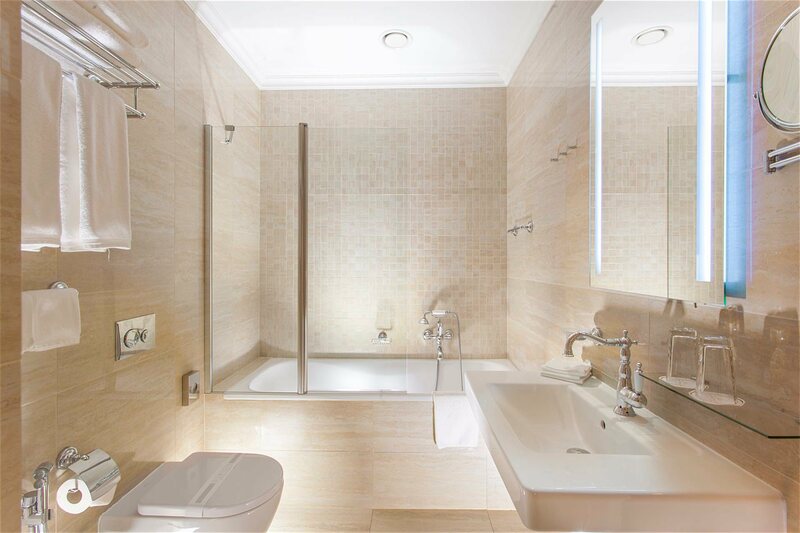 Spacious bathroom, large sunroof, where the starry sky can be observed, and also an unusual area, into which a bed measuring 200 x 200 cm is placed. Combined in a perfect harmony to pop-art style and classic elegant Art Nouveau of the 19th century. None of this will not leave you in no doubt that you have the best, what we provide in the Luxury Spa Hotel Olympic Palace. Even more space. For the whole family. For families that really want to enjoy the space, the hotel offers connecting rooms. 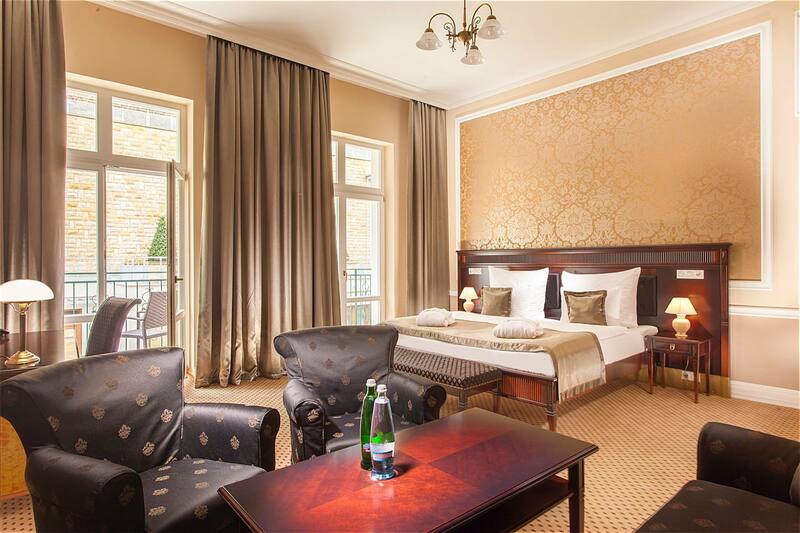 In total you can choose from eight different combinations of linked rooms. Reservation Department is happy to provide information according to your requirements and how to book. (Above) the standard of service. For everyone. Apart from luxury equipped rooms, we also offer serviceses witch contributes to your stay at five star hotel. Whatever the diversity of cosmetic sets or pillows, or an emphasis on environmentally-friendly services. 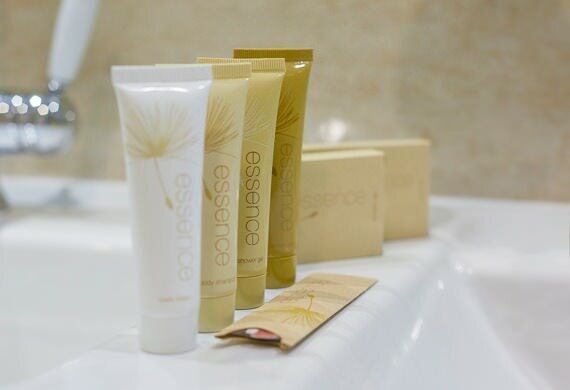 Every cosmetic set contains shower gel, body and hair shampoo, hair conditioner and body cream. We offer three diferent kinds, standard is Essence cosmetic with calming smell of Sandalwood. If you don’t like it you can exchange it free of charge for Nature Philosophy cosmetics with smell of green tee or Four Elements cosmetics with smell of seeweed and mint after which your skin feels smooth and fresh. For an ultimate relaxation you need good night sleep. Each guest need different pillow. In the hotel, guests can choose from 4 different types of pillows. Standard pillow is made from hollow fibre suitable for people with allergy. Upon the request we can exchange it for feather pillow which is light and regulates the heat well, anatomical pillow made from a memory foam suitable for guests suffering from pain in the cervical spine or anatomical roller also from a memory foam. There is Czech saying that cleanliness is half of our health and becuase we are maximalists we do cleaning twice a day. For us cleanliness is complete health. In the morning the main cleaning takes place usually in time before 2 pm., evening cleaning from 6 pm., but we are happy to meet your requirements regarding the cleaning times, don’t hesitate to contact the staff. We are helping to save the planet. 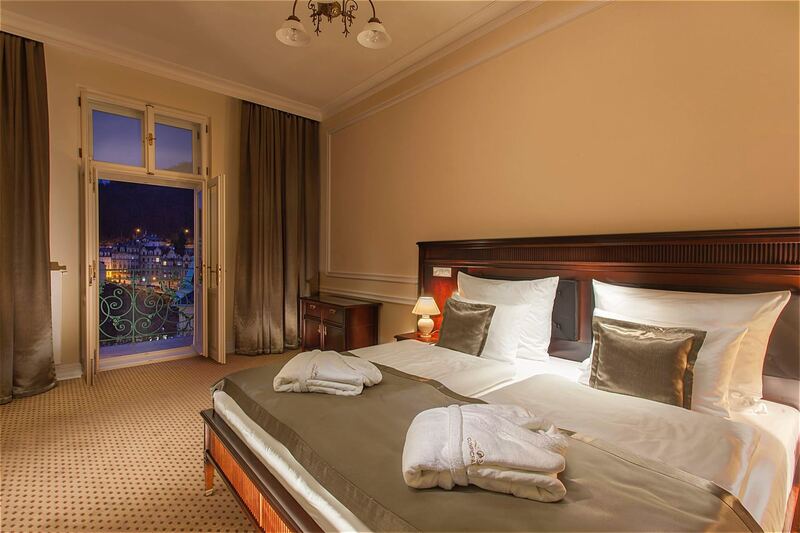 Hotel OLYMPIC PALACE is committed to provide perfect service to assure your comfort. 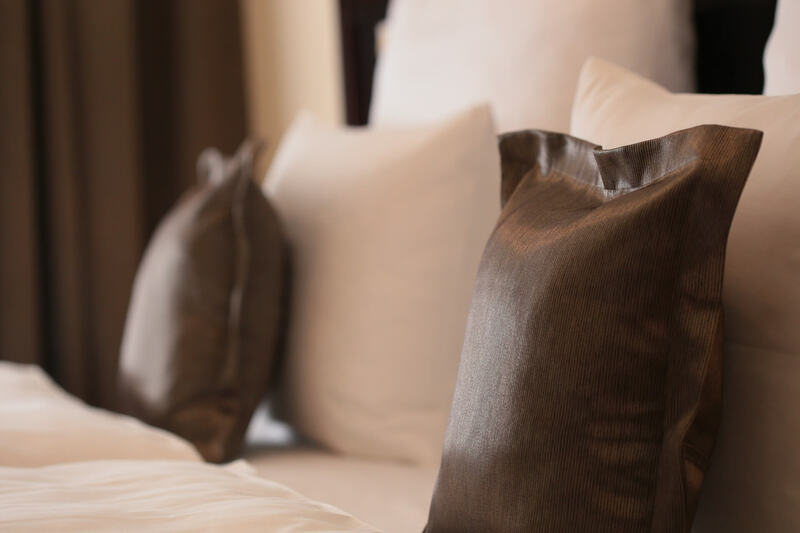 We always replace towels during the morning or evening room cleaning if you put the dirty towels on the bathroom floor, we replace bed linen, bathrobes and slippers together every third day of your stay, we change the hotel cosmetics if fully used or if it is requested we do anytime. For your comfort, we offer a laundry and ironing for a fee. We wash and iron lingerie within 24 hours. We also provide free-to-use in-room Ironing set. For a daily fee, we offer parking places. The number of places is very limited and must be reserved before arrival. For active relaxation we offer sport equipment to hire, like Nordic walking sticks, bikes and scooters for children. For an additional fee, guests can choose and reserve a specific room number with or without a balcony. We offer transport and transfer services, exursions, trips and car hire. Guests can use the serviceses of a professional hairdresser, beautician, manicure and pedicure. We offer transport and transfer services, excursions, trips and car hire. Guests can use the services of a professional hairdresser, beautician, manicure and pedicure. It all just starts with.